Last week, the 75.2m sailing superyacht M5 left the Pendennis facility at dawn for Queen’s Wharf at Falmouth Docks in preparation for her towering 89m mast to be hoisted back into place. This is just one milestone during the major refit of the Ron Holland-designed sloop, which has been with Pendennis since spring 2012 for an extensive overhaul programme. Holland is also responsible for her redesign. 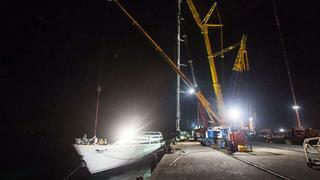 When the yacht originally arrived at Pendennis as Mirabella V, the mast and rigging weighed more than 45 tonnes. Although the mast and spreaders have remained original, the 34 new carbon fibre stays have been constructed with built-in dynamic fibre optics displaying the load through a central computer. This change has reduced the weight of M5’s rig by an extraordinary 18 tonnes. While the rig has lost weight, it is estimated there has been a gain in strength of as much as 30 per cent. A lighter rig up top called for a reduction in the keel weight below, and to further improve sailing performance, Ron Holland Design's calculations required 60 tonnes to be removed from M5's keel, which also balances out her stern and interior modifications that added to the overall weight.